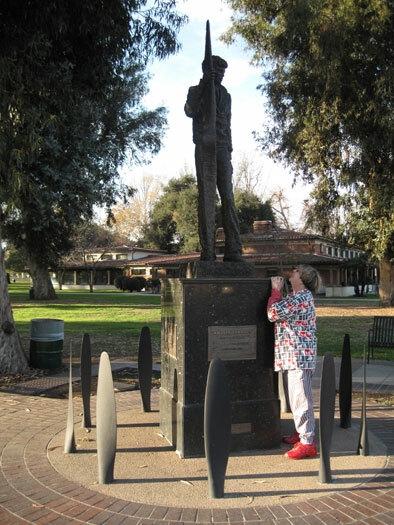 Elvis is alive and well as Amelia Earhart on the corner of Tujunga and Magnolia in North Hollywood, CA. Carrying a propeller blade instead of a guitar, everything else about this Amelia screams the King, like her pompadour hairdo and bell bottom aviator pants. 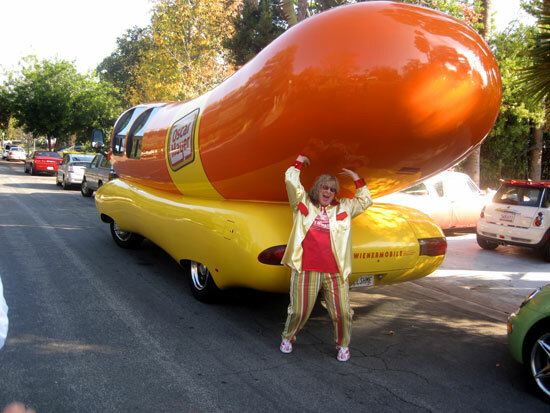 If you’re just jumping aboard The Wienermobile, please exit through the rear and check out Part 1 of my adventure with Susan Olsen,a.k.a. Cindy Brady, and Charles Phoenix, without which Part 2 lacks context. Wagging the tail without the (hot) dog as it were. 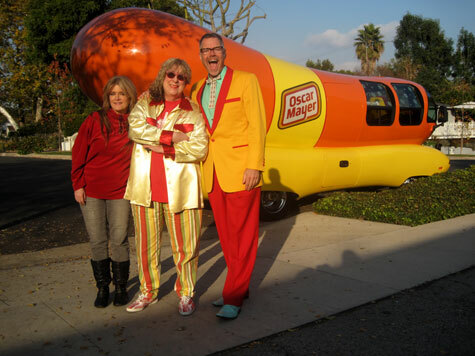 I’ve only waited a lifetime for a ride in the famed Oscar Mayer Wienermobile and last Wednesday, December 14, my dream came true!! Susan Olsen, a.k.a. Cindy Brady, the youngest of the B. Bunch, Charles Phoenix, Mark Blackwell and I hopped aboard and rode the wiener to some of our favorite kitsch spots in the San Fernando Valley. 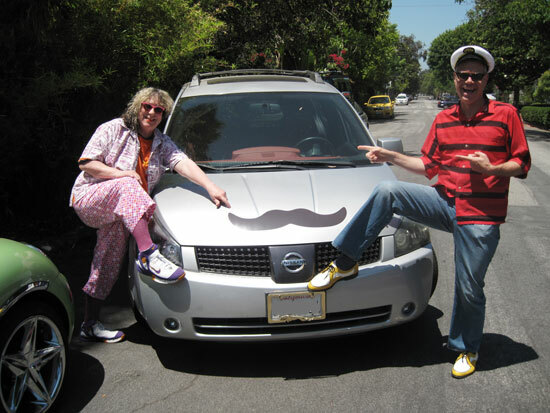 When one is onboard such a vehicle, photo opps are not to be missed! As soon as I read about this alley in downtown San Luis Obispo I knew I had to hit it. 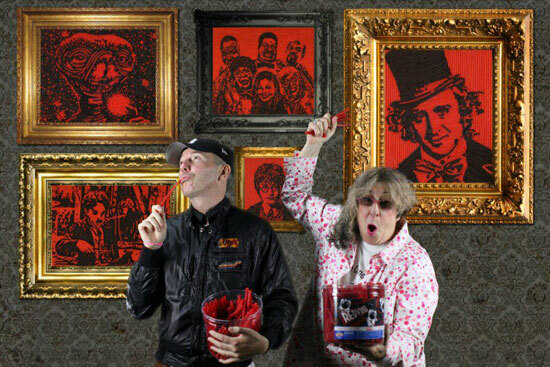 Even with the possibility of it being underwhelming and gross, an assemblage of decades of wadded-up gum had to be paid homage to by any self-respecting aKitschionado. 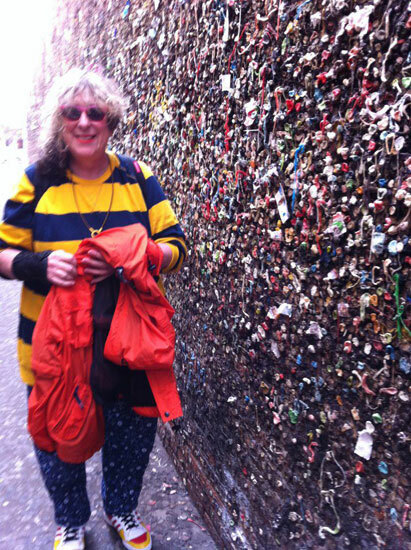 I’m elated to report that Bubblegum Alley is 15 x 70 solid feet of sheer chewed brilliance! Allee Willis’ Kitsch ‘O The Day – Staggering Signs Along Route 1, Saugus, MA. Although when I was in Boston the week before last for the fluffilectable Fluff Festival, all I did was participate in all things Fluff, I did manage to get in an hour of sightseeing, at least the only kind of sightseeing I’m interested in, which is looking for the best and most kitschtastic signs and edifices a city has to offer. 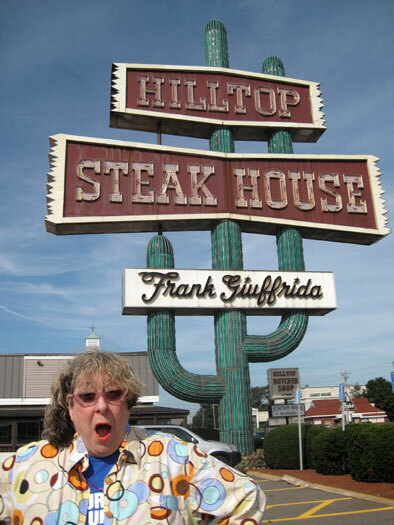 I nearly lost my choppers when I came across the Hilltop Steakhouse on Route 1 outside of Boston. This place was so astounding – from this greatest sign I’ve ever seen, at least 40 feet high and I can’t even imagine what it looks like it night, to the herd of plastic cows grazing outside – that I’m going to give it its own post. I’m shooting for tomorrow but with all the work I still have to get done for my grand performance on the 18th, only time will tell when I’ll actually get that done. But trust me, it’s coming. One of my favorite things about living in a climate where it’s warm enough for people to keep their front lawns going all year round is the crazy things they stick on top of them. 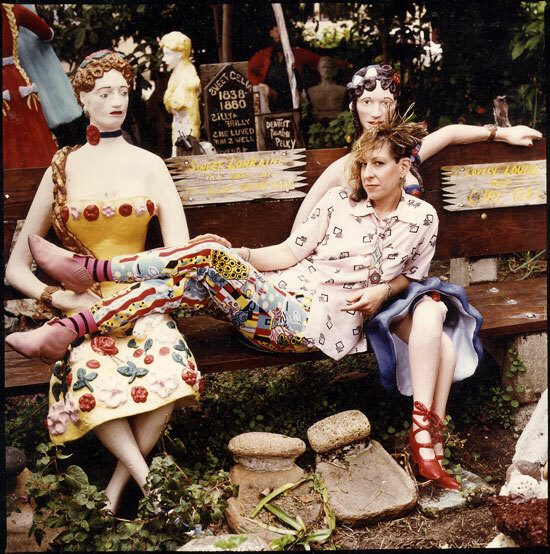 I’m a strong believer in your house, your lawn, your car, your clothes, your hair, your anything being a canvas for self-expression. I’m fascinated enough when people dress up concrete penguins or make picnic areas for plaster frogs and the like. 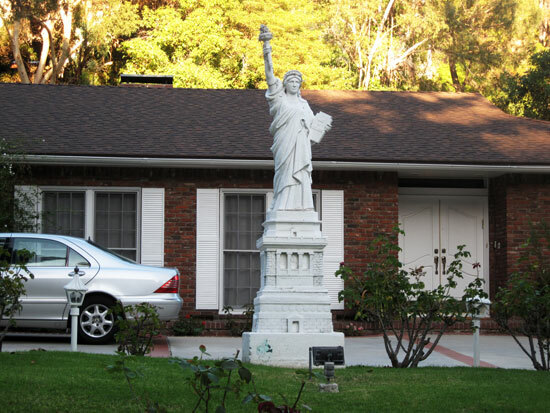 But sticking a giant Statue of Liberty on your front lawn is a statement that only some are bold enough to make. This is one of my favorite things about Beverly Hills. 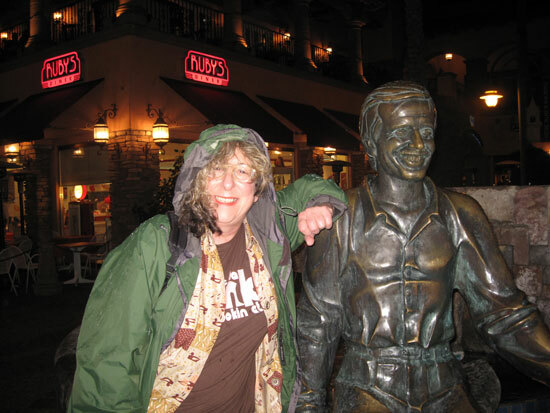 Allee Willis’ Kitsch O’ The Day – My Saturday Drive/Food Fest With Charles Phoenix – Torrance and Inglewood, CA.